Do you hate it that drill holes to install the shower head holder and damage the wall? Do you have trouble with bathing your kids and pets? Do you want to change the position of shower head holder at will? Now, JOMOLA removable vacuum suction cup shower head holder perfectly solve your problems. 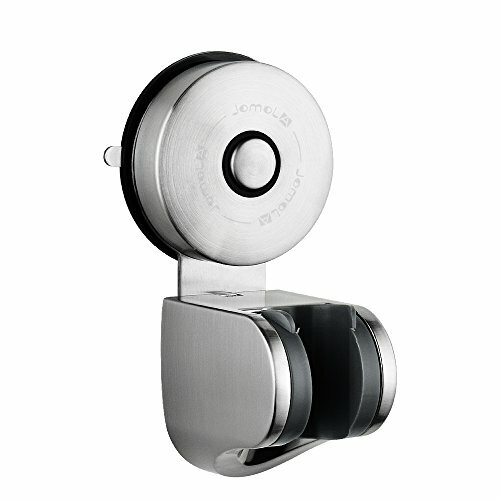 JOMOLA vacuum suction cup handheld shower head bracket adopts vacuum principle to install. Powerful suction allows it to be attached to the wall without drilling holes and screws, no tools required, and no damage to the wall. Universal 4 angles adjustable, you can adjust the angle of the shower anytime and anywhere to enjoy the multi-angle bathing experience. 1. Clean the position you install before installation. Make sure the surface is completely clean and dry. 2. Hold the PVC base, rotate the stainless steel knob cup in an Anti-clockwise manner until it cannot be rotated, make sure that the suction cup is in the pre-installed state. 3. Remove the plastic protective film. Make sure the PVC base is dry and clean, then push the suction cup into the wall and firmly press the center to release air. 4. Follow the installation gesture as shown, turn the knob cup in a clockwise manner to form the vacuum until it cannot be rotated to ensure successful installation. Super powerful suction cup holder: The suction cup base is made of PVC. It can bear 11 lb maximum weight. Vacuum principle make shower head holder hard to fall off in a wet bath. Waterproof hand shower bracket can be reused after washing. Materials and surface treatment: The shower wand holder is made of high quality stainless steel to ensure quality and service life. Adopting brush finish make shower head holder look premium and resist daily scratches, corrosion and gloss. SLOT DIAMETER: 0.86''. Fit 0.86'' hand shower head and bidet sprayer. Universal 4 mode Angle adjustable for you to adjust the angle of shower head anytime and anywhere.You can adjust the shower head down. Easy to use: JOMOLA reusable shower head bracket easy to install & remove. No tools required, no drilling required, and no damage to the wall. It is convenient for you to place the handheld shower head holder for kids in a lower position or anywhere. Notice: Suction cup work by the vacuum but the sticky PVC base which can help you place the suction cups easily. Search "Suction Cup Series Installation Step" to watch more installation videos on YOUTUBE. Only work on a smooth and dry surface, such as windows, glass, mirror, tiles, artificial granite, stainless steel, acrylic, plastic surface, etc. The suction cup is ineffective on uneven and unsmooth surface, such as natural granite, natural marble, painted walls, wood surface, etc. If you have any questions about this product by JOMOLA, contact us by completing and submitting the form below. If you are looking for a specif part number, please include it with your message.